This fun corkboard is disguised as a school locker door! Simply open the door to expose the corkboard. It’s a great way to keep things neat and tidy at your homework desk. 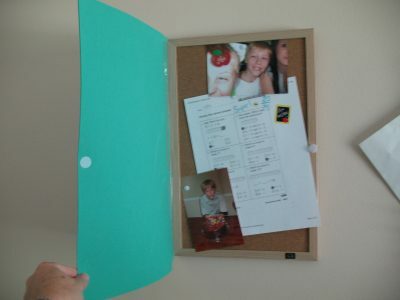 Place bulletin board onto green foam sheet. You want to trim the foam to fit the bulletin board, leaving about ¼” overlap of foam. Cut a strip of orange felt 3 ½” x ½” for the locker handle. Glue it to the right side of the green craft foam. To make the combination lock, place one of the large black circles on the work surface and glue the medium green circle to the center of it. Next, glue the small purple circle to the center of the green circle. Cut the remaining black foam circle in half. You will only need one of the halves, save the other one for a different project. Cut the half circle in half again. Next, trim about ¼” of the border off of both pieces. You will use the two border trims for the combination lock handle. Without using glue just yet, position the lock handle and the lock itself just below the orange locker handle. When you have it where you want it, glue it in place. Use a fine tip marker to add lines around the green circle of the combination lock. Cut a triangle from purple felt measuring 9” x 9”x 4¼”. Glue the purple triangle to the front of the locker so that the point of the triangle is pointing upward at about a 45 degree angle. Do NOT decorate with glitter glue yet. Position the “locker” on top of the bulletin board. Use clear shipping tape to secure the left side of the locker to the left side of the bulletin board. Open the locker door and lay it to the left. Tape the inside of the locker door to the bulletin board. Close the locker door and attach a self adhesive Velcro circle to the right border of the bulletin board, around the middle, somewhere near your combination lock. Attach the other side of the Velcro to the locker door. Decorate the purple triangle with glitter glue. You can write your name or something more general. Place your completed project somewhere out of reach for at least 4-5 hours to allow the glitter glue to dry completely. 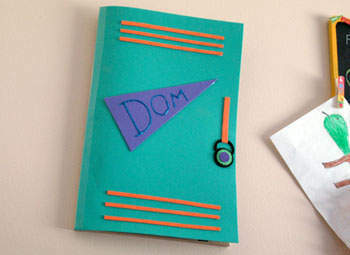 To easily line up your Velcro pieces, first attach one side to the bulletin board then press the Velcro pieces together. Next, lay the locker door down onto the Velcro to attach it.